I’m not the sort of person who gets all moony about mythological unicorns and rainbows, but I do get worked up over animal freaks. Whether it’s two-faced kittens or siamese twin calves or obese monkeys or featherless birds, I’m all about it. I just read about the latest Mother Nature mix-up – a “unicorn” deer living on a nature reserve in Italy. 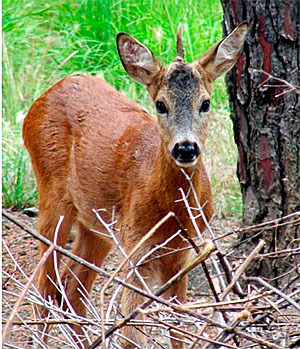 The Italian Bambi’s horn sprouts right from the middle of its head. One-horned deer aren’t completely uncommon, but usually the lone horn will erupt from one side of the animal’s head.